When a violent encounter with a shoplifter leaves half of their team fired or in the hospital, the security guards of a downtown Chicago retail store find themselves under corporate investigation. Short-staffed, ill prepared and faced with accusations of racial profiling that threaten to dismantle the crew, they're forced to decide: do we admit to something we're not guilty of to save our jobs, or do we give the higher-ups a taste of what it's like in the trenches? In the style of their breakout hit At The Table, Broken Nose Theatre and playwright Spenser Davis have assembled an all-star cast to develop this world premiere. "...But "Plainclothes" clearly was thrilling its audience on Thursday night - Broken Nose and its actors are all skilled, live and in the moment, and there is a rather delicious sensibility that anything might happen. Along with New Colony (another hugely talented Chicago company that tends not to cut or polish), Broken Nose really is redefining the storefront aesthetic in this city. The show has a element of improvisation, but also a hyper-naturalistic sensibility and several amped-up performances from the likes of Alejandro Tey, Stephanie Shum and RjW Mays, who is exceptionally funny. There are eleven actors in this cast - all crammed into a crummy office that doubles as a jail." "...But there's no getting around the fact that the central incident and subsequent corporate drama that all of the timely questions about racial profiling and quotas and law enforcement's handling of petty offenses hinges on just doesn't ring true. Even though it doesn't quite reach the level of profundity it strives toward, Plainclothes functions as a smart, observant hangout work comedy." "...Davis clearly has writing and directing chops�he sets up situations well, understands pacing and writes good dialogue�but Plainclothes would be stronger performed in one act with more emphasis earlier on the cover-up, which now comes arbitrarily out of left field. Also, characters must say each other's names early and often�Playwriting 101�since the program doesn't list them in order of appearance. Finally, a subplot between Booty Shorts and Mary, an older store employee ( astutely performed by RjW Mays ), is extremely effective but unconnected to the plot ( although it has to do with racism ). Can it be made intrinsic to plot?" "...Co-directed by Davis and Kanom� Jones, the play was developed in concert with the cast�a process inspired by the one that writer Michael Perlman used for At The Table, which Davis directed for Broken Nose Theatre last year. The dialogue in Plainclothes achieves a similarly naturalistic, overlapping flow, but with far greater energy and volume. (It�s the difference between a babbling brook and burst water main.) Davis doesn�t quite pull off some of the sleight of hand moves his story requires�the first scene after intermission contains a plot twist so severe it feels more like a reboot�but Plainclothes� rococo mixture of vivacity and cynicism carries it out of trouble and onward towards its raucous conclusion: one where cowardice becomes indistinguishable from malice." "...Davis does an excellent job with casting an ensemble that seems to have formed a picture-perfect, textbook cast. Each character does an amazing performance of playing off the other character like a masterful piece of a puzzle collectively telling the story of their challenges working security. This play is what all wanna-be actors should see if they are interested in acting." "...�Plainclothes� is ensemble work at its finest. Even the actors with less stage time shine when they come in. That is an amazingly positive side effect of the workshopping done by Davis and co-director Kanom� Jones. This play is, undoubtedly, a collaborative gem." "...This exciting new play by company member Spenser Davis absolutely explodes upon the Den Theatre stage and leaves its emotional shrapnel embedded in the mind every audience member. It�s raw and rugged, populated with fascinating, colorful characters and features a story that will haunt the theatergoer and refuse to leave for a long time." "...The storytelling is arresting! I want to tune in for another episode, maybe even binge it. The talented ensemble make us care about their individual stories and dreams. 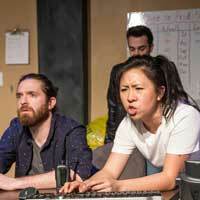 PLAINCLOTHES is comedy with depth." "...The humor in Davis� sharp script never falters. According to the local cop (Kim Boler), the American Girl store is �where dreams put on dresses and die.� Sales associate Mary (RjW Mays) took one bite of Brady�s delicious quiche �and saw the afterlife.� Mixed-race Llermo (Alejandro Tey) describes Michael Bubl� as �zero-calorie Sinatra� and Bubl�s holiday loop as �worse than waterboarding.�"